2 Fill 2 glasses with ice, if desired, and pour the juice into the glasses. Serve immediately. No juicer? No problem. 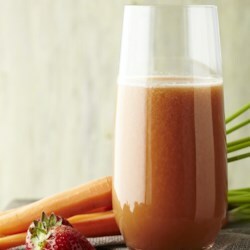 Try this DIY version of blended and strained juice instead: Coarsely chop all ingredients. First, place the soft and/or juice ingredients in the blender and process until liquefied. Then, add the remaining ingredients; blend until liquefied. Cut two 24-inch-long pieces of cheesecloth. Completely unfold each piece and then stack the pieces on top of each other. Fold the double stack in half so you have a 4-layer stack of cloth. Line a large bowl with the cheesecloth and pour the contents of the blender into the center. Gather the edges of the cloth together in one hand and use the other hand to twist and squeeze the bundle to extract all the juice from the pulp. Wear a pair of rubber gloves if you don't want the juice to stain your hands.